Laminins are dynamically and precisely localized on muscle fibers, and even within the synaptic cleft (Figure 1.5). In embryonic muscle, one finds trimers of a5, P1, and yl. However, during late embryogenesis, a5 is gradually replaced by a2 in most of the muscle, but a5 expression persists at the NMJ and the protein is localized throughout the synapse46'47. Similarly, laminin trimers containing P2 (or S-laminins for synaptic laminins) are found only at the NMJ in muscle48. Trimers containing laminin a4 are also restricted to the NMJ, and show even greater specificity in their localization, flanking the active zone and junctional folds, effectively surrounding the actual sites of synaptic transmission49. Such specific localizations suggest synaptic functions for these laminins. Additional biochemical and genetic data have proved this to be true. Figure 1.5. Laminin within the Neuromuscular Junction. Laminins have differential localizations within the muscle ECM and the neuromuscular junction. In extrasynaptic portions of the muscle ECM, the predominant laminin trimer is composed of a2, P1, and y1 chains. Within the synapse, the P1 chain is largely replaced by p2. 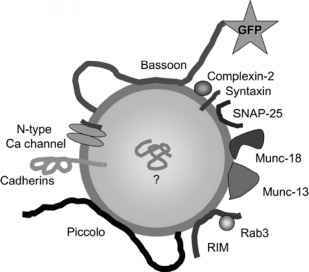 a2-containing trimers are also found throughout the ECM of the synapse, as are a5-containing trimers. a4-containing trimers are found only in the region of the synapse flanking the active zone. 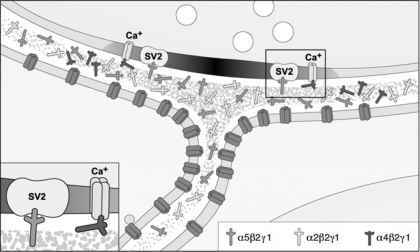 The laminins interact with many other proteins, but of particular interest at the NMJ are interactions of a5 with the presynaptic protein SV2, and P2 with presynaptic voltage-gated calcium channels. Through such interactions, the laminins organize the subsynaptic architecture of the NMJ.